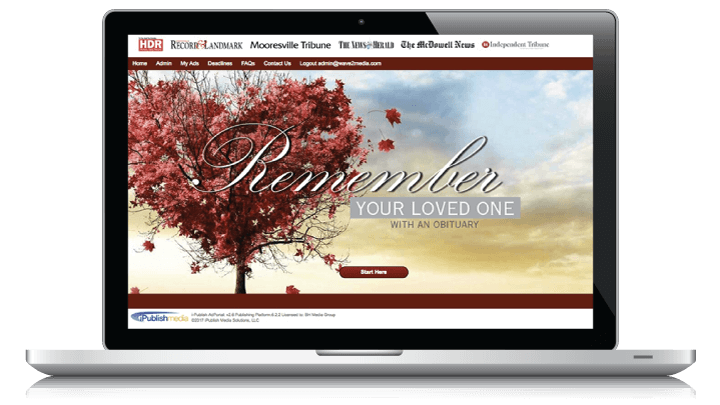 AdPortal Obituaries is a self serve newspaper obituary software platform licensed by hundreds of community publishers offering print obituaries and digital listings to funeral homes and private parties. Publishers use it as their front-end for 100% of their print and digital obits and benefit from higher revenue and lower operational costs. Seamlessly integrated within the print obituary workflow to create beautiful, respectful listings that appear in an iframe on the publisher’s website or a co-branded website hosted for the publisher. 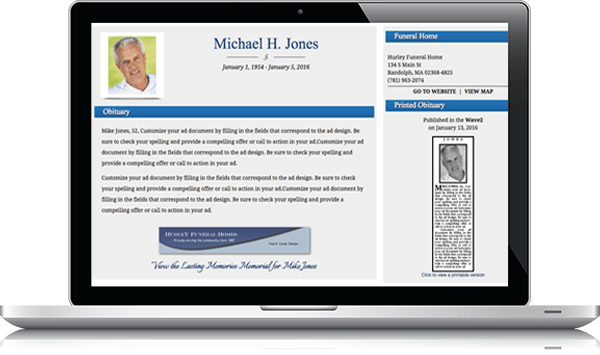 These digital listings are also incorporated into Lasting Memories and can appear on the funeral home’s website as well. The industry’s first social media memorial website application owned and managed by the family to honor and celebrate their loved one’s life. A unique URL is generated and provides immediate digital revenue protecting a publisher’s print revenue in the process. Implementing Lasting Memories in your market is a strategic move that will position you to keep control of your obits market as digital alternatives to your print obit arise. Create and upsell special sections for obituaries seamlessly using content that has been previously stored in the AdPortal Obituaries platform. Available to non-AdPortal customers as well (see Legacy.com’s press release about AdPortal Tributes). Publish monthly, quarterly, semi-annually or annually to generate substantial incremental revenue. 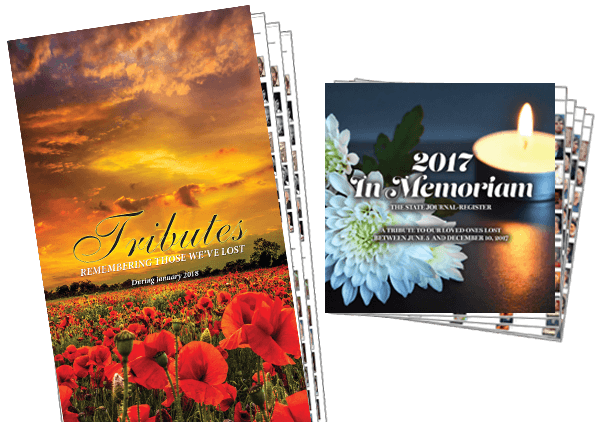 AdPortal Tributes paginates each market’s special obituaries section as a print-ready multi page PDF or native Adobe InDesign file. Reliable and Easy to Use. We have been using iPublish Media for Obits for the past 5 years and are now up to 77% of all Obits coming through the portal. Notices placed through “eObits” are larger so there has been an increase in revenue and, of course, there is a near zero error factor. The program is reliable. We are very pleased with the results. AdPortal Obituaries is live in 18 of our markets. BH Media has a very good relationship with iPublish. The team is always very very easy to deal with which gives us a comfort level in their ability to support the launch of new products. I enjoy working with the entire iPublish team. They are always so accommodating. I was absolutely fascinated with how strong Obits are. Making the move to iPublish Media’s AdPortal Obituaries enabled us to re-energize our print obits in a number of different ways. 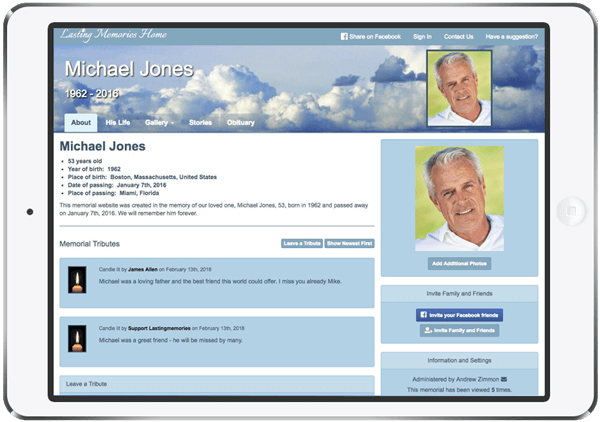 We now offer enhanced obituaries that read more like a story and have more data points to engage the reader which are a big hit in our markets.